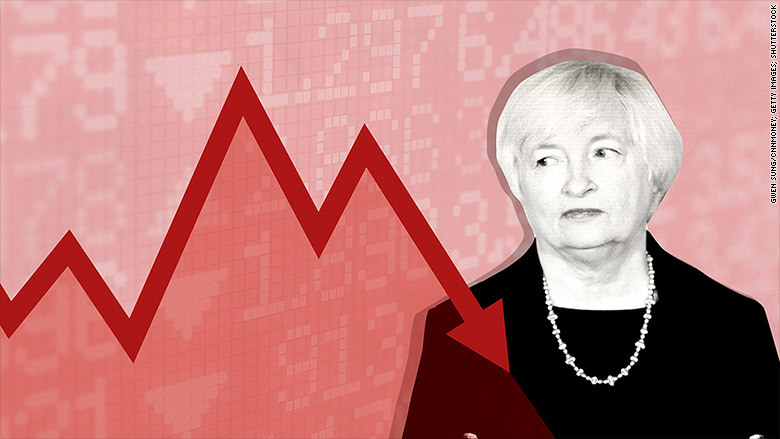 Is the stock market holding Janet Yellen hostage? Normally the financial markets dance to the tune of the all-powerful Federal Reserve. But now the tables have turned. The Fed's decision last week to delay raising rates was caused at least in part by turmoil in the financial markets. It looks like now the Fed is being held captive by the market -- and its temper tantrums. "It's not just that they're being held hostage. They've actually volunteered to be hostage to the markets," said David Kelly, chief global strategist at JPMorgan Funds. All of this is fanning fear that Fed chief Janet Yellen and her colleagues may be trapped at near-zero rates -- the level at which they've been since the height of the financial crisis in 2008. Even though we have not been in a crisis scenario for some time, the Fed has hesitated to lift rates. There's always been some reason. In the last couple of years, the hesitation was fueled by fears that it might kill a fragile economic recovery. Today, the stock market is scaring the Fed. That's a dangerous thought, given how volatile and unpredictable it can be. Related: The Fed did nothing. What now? Market forces not economic fundamentals driving policy? U.S. and global markets plunged in late August over signs that China's economic slowdown was deepening. The fear was that China, long the world's engine of growth, could derail the global economy. At one point the S&P 500 was down nearly 13% from its July peak. So, though Yellen sounded mostly upbeat about the U.S. economy, she explained the move by specifically pointing to "volatility in financial markets" caused by global growth worries. Some investors and Fed watchers were startled by the Fed's rationale. They believe it shows outside forces, not economic fundamentals, are now driving policy. "In nearly 50 years of analyzing the Fed, I've never seen anything like this," said David Jones, a former Fed economist who is now president of DMJ Advisors. People forget that the Fed itself helped fuel this summer's market volatility. Deep uncertainty over when the rate liftoff would occur regularly spooked investors. Frustration over the Fed's vague rate hike plans helped cause the Dow to drop almost 300 points on Friday. The irony is that the Fed seems to be helping cause some of the market turbulence that is keeping it from raising rates. "We are concerned about this vicious cycle in which more market volatility leads the Fed to delay, which in turn causes more volatility," said Roger Aliaga-Diaz, senior economist at Vanguard. Michael Block, chief market strategist at Rhino Trading, puts it more bluntly: "The FOMC...and the rest of us are trapped." Incredibly, even Yellen doesn't rule out this idea of the Fed being stuck in a vicious cycle. The Fed chief was asked by a reporter last week if she's concerned the central bank "may never escape" from extremely low rates. While Yellen called this an "extremely downside risk" that she doesn't anticipate will happen, she also admitted she "can't completely rule it out" either. It was not a comforting answer from the world's most powerful woman. Related: Negative interest rates...in the U.S.?! Yellen stressed that "the Fed should not be responding to the ups and downs of the markets and it is certainly not our policy to do so." The problem is the Fed is increasingly being perceived as doing just that -- instead of relying on economic fundamentals to make decisions. All of this speaks to a credibility problem as investors weigh whether a rate hike will come next month, in December or not until next year. "Perception is everything. She said October is in play, but can you believe her?" asked Jones. So how does the Fed get back in control of the situation? One option is to suggest an October rate hike is coming and then follow through and actually do it, even if the market doesn't like it. That would certainly show that the Fed isn't scared of the market and is confident in the American economy's ability to overcome global headwinds. An October rate hike would "reduce uncertainty, help the equity market and the economy," said JPMorgan's Kelly.